The Arcturan UltraTheremin, perfect for a little serenading on Squornshellous Zeta after a few too many pan galactic gargle blasters. Designed for Konkreet Performer and iPad control via OSC. It’s a three voice instrument played with three nodes on a Konkreet Performer touchscreen. The angle represents pitch, proximity to the central node adds vibrato. 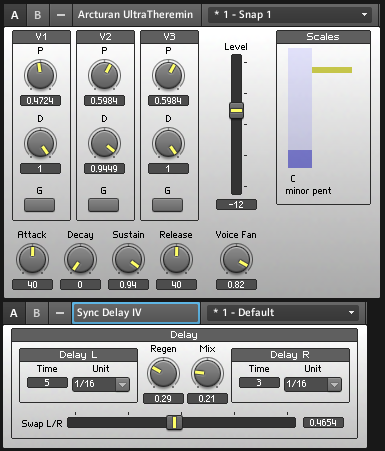 Will upload the file if there’s interest… how many people are using KP with Reaktor? And you probably thought the polyphonic theremin was a joke! This entry was posted in Downloads and tagged instrument, Konkreet Performer, Open Sound Control, OSC, reaktor, theremin on April 4, 2011 by peterdines.